Despite falling in October, car sales in Russia returned to 2013 levels in November. Meanwhile, sales were up in the luxury segment: Porsche sales skyrocketed by 55 percent, and Lexus sales jumped 63 percent. Analysts say the spike in car sales is a predictable result of the collapse of the ruble, with Russians looking to safeguard the value of their savings. After dropping by at least 10 percent in October 2014, car sales in Russia were back at their 2013 level in November, with the luxury segment showing a huge leap in sales. According to research by the Association of European Business (AEB), sales edged down a mere 1 percent year-on-year in November 2014 in Russia, at 229,400 vehicles sold. Luxury brands, however, saw a major jump in sales. 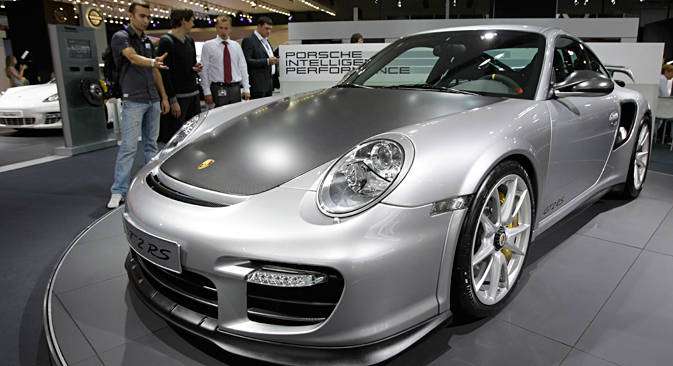 Porsche sales grew by 55 percent in November, while Lexus sales skyrocketed by 63 percent. KIA sales grew 19 percent in Russia, Renault sales rose 8 percent, Toyota sales were up by 32 percent, and Mitsubishi sales grew 11 percent. Meanwhile, Avtovaz, the leader in the Russian auto industry, saw a 17 percent drop in sales in November. For the first time ever, the Lada Granta ceased to be the best-selling car on the Russian market, yielding first place to the Kia New Rio. Experts attribute the sudden desire to buy cars to the falling ruble. “Demand for cars in the retail segment has been unprecedented in the last several weeks. It has been aided by the state subsidy program and the moods of buyers, who have been in a hurry to purchase prior to the expected rise in prices in the New Year,” Chairman of the AEB’s Automobile Manufacturers Committee Joerg Schreiber said. According to the AEB’s data, “the forecast for December is also quite optimistic, which increases the chances for a solid close to this difficult year for the Russian auto market,” he said. Schreiber attributed rising sales to the state program aimed at updating cars via recycling, as well as to the declining ruble, which has compelled consumers to invest money in buying cars at the old prices. Head of Leasing at UFS Stanislav Skatkin said that “the ruble devaluation has led to growth in demand for cars,” explaining that order to preserve their savings, which are losing value every day, Russians are trying to invest them in cars. “November of this year was the best month of the year in Russia by volumes of car sales.,” said Konstantin Korishchenko, who heads the Department of Stock Markets and Financial Engineering at the Russian Presidential Academy of the National Economy and Public Administration. According to him, these dynamics indicate that people are afraid prices are going to rise and are accordingly trying to spend their rubles before they lose their value. “Almost 50 percent of the ruble’s devaluation against the main global currencies is generated by expectations of future inflation,” he explained. The government’s support program, which allows used car owners to get a new car at a discount, has made a significant contribution to higher sales. According to the Industry and Trade Ministry, more than 130,000 cars have been sold under the program. Altogether, the ministry plans to sell 170,000 cars under the program by the end of the year. According to Stanislav Skatkin, rising demand from Belarus, where prices are 30-50 percent higher in Belarus than they are in Russia, has also supported the industry. “The majority of Belarusian savings are in foreign currency, and they realize that it’s better to go to Russia and buy cars by exchanging dollars for rubles at the current exchange rate. Even now there is a visible difference in new car prices among dealers in Belarus and Russia,” Skatkin said. However despite the rising demand, the Industry and Trade Ministry predicts a potential 8 percent decline in the production of cars, LCVs, and trucks in Russia this year. “The market should show some growth in December 2014 because people will buy up the remaining vehicles. At the same time, many automakers have already raised prices for their cars, so buyers will look at them less often and try to find a better offer from dealers,” said Skatkin.